Back when I was young, I remember my mom hosting a baby shower in my childhood home – gosh, it must have been for my cousin Sydney, but my mom or aunt would have to confirm. She hit up our Greek market for olives and fresh feta and grape leaves, none of which interested me at the young age of 10. But she also scored triangles of spanakopita (spinach was still gross to me at that age) and these miraculous cheesy alternatives called tiropita. I had my first taste of them sneaking one before the guests showed up and man, what a treat. 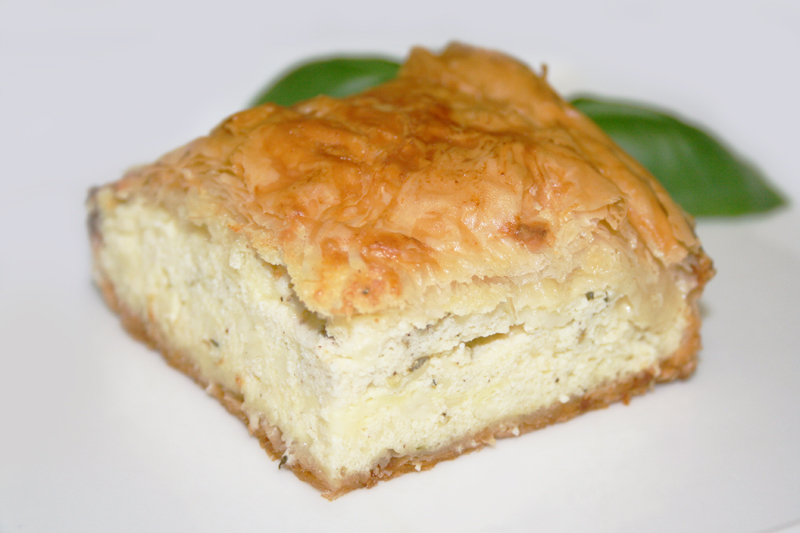 Salty feta and crisp, buttery phyllo folded into golden triangles of deliciousness. All of this was well before phyllo dough and phyllo appetizers became common fare at the market, and I’m kind of happy that it’s so easily accessible now. I’m able to pop into the grocery and make a lavish cheese pie of my own, all without any crazy trips to the market. I cut down on the traditional amount of feta and amp up the flavors with nutmeg and dried mint. I keep things creamy with a bit of ricotta as well, but feel free to substitute other cheeses such as cottage cheese or even crumbly, salty mizithra. Though I typically make this in a 13x9x3 inch pan and cut it into squares, this also works exceedingly well in a deep dish 9 inch round pan cut into triangles. If you’re planning a party of sorts, consider making this tiropita with a spinach pie as an accompaniment and a greek salad to tie the whole thing together. It’s a whole lot of buttery goodness without any fuss. And we all know that fusses are way overrated. In a standing mixer (or with an egg beater), mix together all of the ingredients except for the phyllo and butter until well incorporated. Grease a 13 x 9 in baking pan. Working carefully and quickly, lay out a sheet of phyllo and butter with a pastry brush. Keep on alternating melted butter and phyllo until you have laid down half of the phyllo. Pour the cheese mixture on top of the phyllo. Top with alternating layers of phyllo and butter. Once you’ve finished with all of the sheets, cut the pie into squares before baking. Place in the oven and bake on 350° for 45-50 minutes. If the top starts to get too brown, cover with foil for the remainder of the cooking time. Let sit for around 5 minutes before cutting. Serve.